Roulette may just be a game of chance, but that hasn’t stopped it from remaining a casino favorite for hundreds of years. It offers the potential for huge payouts without players having to use any strategy at all, meaning even novice gamblers can join in on the fun. The spinning wheel remains familiar to players around the world as a classic symbol of casino gambling. 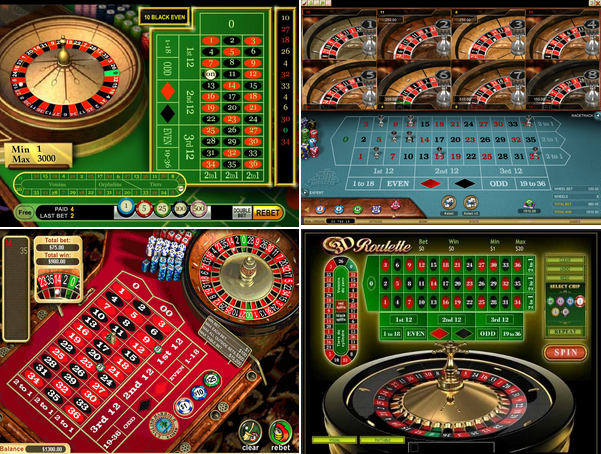 Online roulette has been around since the early days of online casinos, as it’s an easy game to port into the virtual world. The spins may be simulated, but the immersive graphics recreate the feel of a real Las Vegas or Monte Carlo game, with the same odds, bets, and payouts as any live table. The rules of roulette are very simple. Players make bets that predict where a ball will land on the wheel which is divided into numbered sections. The numbers range from 1-36, along with a 0 (and on some wheels, a 00 or “double zero”). Before the croupier spins the wheel, players can place bets on any number of different number combinations, all of which are described below. Once the croupier places the ball into the spinning wheel, there will be a moment or two for players to place their final bets, after which he will wave off all further bets. When the ball comes to rest in one of the numbered pockets, the croupier will announce the winning number, as well as the color of that pocket. Losing bets are collected, while winning bets are paid out. Once all bets have been paid out, players can collect their winnings and make their bets for the next spin. A bet on a single number. If that number is the winner, the bet pays 35-1. A bet on any two adjacent numbers on the table. If either number wins, the bet pays 17-1. A bet on any horizontal row of three numbers. If any of the numbers win, the bet pays 11-1. A bet on any four adjacent numbers that make up a square. This bet pays 8-1 if any of the numbers win. A bet on any two adjacent horizontal rows of numbers. If any of the six numbers win, the bet pays 5-1. A bet on the numbers 0, 00, 1, 2 and 3. If any of these numbers wins, the bet pays 6-1. A bet on any of the 12 numbers in one of the three columns on the table. If any number in the column wins, the bet pays 2-1. A bet on any of three groups of 12 numbers (1-12, 13-24, and 25-36). If any number in the dozen wins, the bet pays 2-1. A bet on all odd (or even) numbers. If any number of that type wins, the bet pays even money. A bet on all red or black numbers. If a number of that color wins, the bet pays even money. A bet on all numbers in the specified range. If a number in that range wins, the bet pays even money. The bets on columns, dozens, and even money bets are known as outside bets; all other bets are known as inside bets. Typically, while a player is welcome to make bets both on the inside and the outside, the player cannot combine these amounts to reach the table minimum; they must make at least the minimum bet on each outside bet, and the total of all inside bets must equal at least the table minimum. It’s also worth noting that the zero and double zero both lose on all outside bets. There are several differences that distinguish American version from the European version of the game. As both games are offered at most online casinos, it’s important to understand which game you’d like to play before jumping in. American roulette typically features both a zero and a double zero on the wheel. Some high limit games feature single zero games, but they are in the minority. Typically, when an online casino offers American roulette as an option, they are referring to the double zero game. Conversely, the European version is always played with a single zero wheel. European roulette games also often feature “en prison” rules that make even money bets an even better proposition for the player. These rules state that if the wheel lands on zero, even money bets are “imprisoned,” and can be released back to the player if the bet wins on the next spin. Otherwise, they will lose. In some casinos, the player loses only half of their even money bet if the ball lands on zero, with no imprisonment. Internet casinos mostly follow the standard set of rules. The majority of them offer both American and European variants, allowing players to choose whichever game they’re more familiar with. It’s important to note that European roulette is always the better bet. There are a few things to look out for if you’re playing online for real money. If you enjoy tracking numbers, you’ll want to look at a few different software packages; some feature extensive statistics for the player, while on others, you’ll need to track the numbers on your own. At European tables, you’ll also want to understand exactly what rules are being used. Some “European” tables online are simple single-zero roulette, while others use different variations of the en prison rules. You can find details on how these rules affect the house edge in the odds section below. Five different games to choose from including new form of the game called multi-wheel roulette. Compatible with Android and Iphone. Uses Microgaming casino software. Also have an option to play on your mobile phone. Save up to eight bet layouts in 'Expert' mode. Choose from American, European and French versions. Is there Any Strategy that Works? For the most part, there is very little strategy in roulette; since it is entirely a game of chance, there isn’t much a player can do to affect their odds of winning. Not only that, but with the exception of a single bet, every bet on the table has the same house edge; in the long run, the house will expect to win at the same rate no matter where you put your money. But that doesn’t mean there’s nothing to watch out for when you play roulette online. When choosing an online game, look for the European version; the house edge is much lower than in it’s American counterpart. If you insist on playing the American one, you’ll want to avoid betting on the “Top Line” or “First Five” bet; this bet, which covers the number 0/00/1/2/3, carries a higher house edge than any other bet. While you can’t do much to change the house edge, there are different styles of play that may appeal to you. If you’re hoping to make a big score, betting on single numbers will allow you to occasionally win big when you’re lucky enough to hit the numbers you’ve bet on. On the other hand, if you’d like to take a more conservative approach, spreading many bets around the table at once, or simply betting on the even money bets (such as red/black or odd/even), are likely to cause your bankroll to rise and fall slowly. It’s worth mentioning that while betting systems, such as the Martingale System, can change how often you show a profit in your sessions while playing online roulette, they will not change the house edge over the long run. In the case of the Martingale, you will find yourself winning in most of your sessions; however, when you do lose, you will lose big, which will more than cancel out the gains made in winning sessions. Understanding roulette odds is rather simple, as most bets have exactly the same house edge. On an American table, almost all bets have a house edge of 5.26%. The one exception mentioned above, the “Top Line” bet, has a house edge of 7.89%. Single zero games have a much lower house edge. A typical single-zero game found in many American and online casinos has a house edge of about 2.70%. European roulette offers even better odds, thanks to the “en prison” rule, which allows the player to get half of their money back on an even money bet if the ball lands on the zero. With this rule in place, the house edge is cut even more, down to about 1.35%. In some casinos, the bet is instead imprisoned; in that case, it is given back to the player should they win that bet on the next spin, otherwise it is lost. These rules are very similar to the basic “en prison” rule, and only affect the house edge slightly (raising it to somewhere between 1.37% and 1.39%, depending on the number of times the bet can be imprisoned before it is lost). Unlike many casino games, the house edge in roulette (at least in basic single and double zero games without en prison rules) is actually trivial to calculate. All bets are designed to pay out a mathematically fair amount for a 36-number wheel. However, the addition of one or two extra numbers – namely, the zeros – gives the house its advantage. This means that for a double zero wheel, the house edge is 2/38 (5.26%), while for a single zero wheel, the edge falls to 1/37 (2.70%).